I heard rumors of a car with a built in espresso machine several years ago, but I figured that it was a coffee-lover’s urban legend, or perhaps the kind of custom-mod that an ultra-rich car collector might add to one of his or her pricey rides. Apparently, however, Fiat is making this dream a reality. Fiat will be including in-car espresso makers in its 500L model. 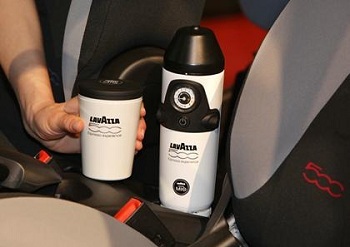 The machines are made by Lavazza and are designed to flow well with the rest of the car’s interior styling. They come equipped with two matching travel mugs, one for the driver and one for the passenger (or two for the driver, if you’re like me). This caffeinated car will be available in Europe starting this fall, but the car itself – a four door version of the stylish, but tiny, Fiat 500 – isn’t scheduled to be released in the US until 2013, so we still have to stick to the drive-thru or traditional coffee shops until then.